The Fern and Mossery: Pincushion plant? Anyone have any experience with the so-called pincushion plant? I friend of mine had one and it died. But the leaves remind me of Baby Tears and through comparison and deduction I am wondering if it would be suited for terrarium life? Those little orange fruits would certainly look cute under glass. And in other news-- I apologize for the lack of content of late. Let's just say the GRE is a little annoying. However I'm still hurtling full speed ahead for grad school and hopefully I can make more time for the ol' blog. I bought like three of those things and all of them DIED! Ah, Nertera granadensis. Apparently they like moist, bright conditions, but hate being waterlogged or sunburned. A fine line there. Sounds a bit high maintenance for me. But gorgeous regardless; and orange is my favourite colour! I'm with Trinh I'm afraid - they look great but are very tricky to keep alive. If they can mass produce these guys, presumably in greenhouses in Florida, they can't be too hard to grow in a terrarium. For sure. Next time I see this plant for sale I'll buy it and try it. We need a definitive experiment! Love your blog! I'm learning so much from it! Regarding this plant, anyone tried this in a terrarium yet? Might wanna avoid misting, instead wetting the soil directly to avoid causing the leaves and berries to rot. Also, with it's abundant berries and the constant need to remove them when they wilt/die to prevent rot/mold, it might be too much of a hassle. I got mine and left it growing in a pot. Didn't last a week haha. 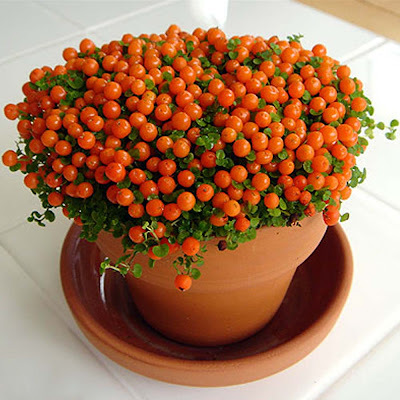 QUOTE: "As a house plant, Nertera granadensis is somewhat difficult to maintain, and it is not recommended for beginners. The soil should be porous. It should be kept in a bright, semi-shaded place - a south facing window is ideal - and should not be left in direct sunlight. During the summer, Nertera granadensis can be kept outdoors, but it still needs to be protected from direct sunlight. The temperature should not be too warm, although it should not go below 8 degrees Celsius (around 45 Fahrenheit) in the winter.During the winter and autumn gardeners should wait until the soil dries between watering. When the flowers and berries begin forming in the spring, one should increase watering so that during the spring and the summer the soil is kept moist at all times, and the leaves and berries should be moistened occasionally, but not too frequently, as they could rot. The plant should be fed monthly with a weak solution (water-soluble fertilizers, diluted to half strength, are best) during spring/summer until it begins to flower. When the berries begin to die (turn black) they should be carefully removed". Thanks for that info, I.O.! It does sound like a touchy plant. I, for one, have not tried it in a terrarium. I wonder if a warden case that would provide wide access to prune the plant would be best.